Students in England can do honours degrees in two years, under new "fast track" plans to save time and money. "Compressed degrees" are being tried at five universities, so students can begin work sooner and with less debt. Higher Education Minister Bill Rammell said the UK must compete with the economic power of China and India. But the National Union of Students said a two-year course may be more difficult to afford since there was less time available to do part-time work. Its national secretary, Gemma Tumelty, said: "We're really concerned that intense study will reduce the opportunity to work during the holidays, to be able to pay for their living costs throughout the year. "Therefore this might not be a choice for those lower income students who need to work to reduce their debt further - and these are the very students that clearly they're trying to attract through this." The traditional full-time course pursued by most undergraduates takes three years - four in Scotland . 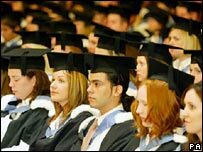 The move to reduce the time it takes - first announced in 2003 - signals a new effort to increase the proportion of young people with higher education qualifications. The government has a target of 50% by the end of the decade, but projections suggest it might struggle to meet this. From this autumn, full-time undergraduates face tuition fees that will in most cases be £3,000 a year compared with the present £1,175. Most will not have to pay this until after they graduate - but cutting a typical course by a third would, when living costs are also taken into account, reduce graduates' debts substantially. Staffordshire University, Derby University, Leeds Metropolitan University, University of Northampton and The Medway Partnership in Kent will pilot the fast-track courses from September. Staffordshire University is offering five subjects - English, English and philosophy, geography, law and product design - and plans to have more for 2007-08. "Fast-tracking students, rather than break for the summer, use the summer vacation periods as a third term," it says. "Study during the summer will be delivered through, what we call 'blended-learning', a combination of face-to-face 'summer school' style workshops, internet-based distance learning and tutor guided independent study." Mr Rammell said higher education had to take more account of the needs of different customers. Traditional degrees had been organised for the convenience of academics rather than students, he said. "The assumption was that studies would be taken over a fixed period of time, punctuated by a holiday pattern driven by university rather than student needs," Mr Rammell said. He added: "But just because a model fits some people well doesn't mean it fits all - and increasingly we live in a world where people expect that service providers will have scope to offer flexibility, not uniformity." The Labour government has already introduced two-year degrees in vocational subjects, designed in close collaboration with employers. These "foundation degrees" have been its main driver of growth within higher education. But to convert them to full honours degrees students have to complete a further year or two of study. In response to the proposals Shadow Minister for Higher Education, Boris Johnson, warned against sacrificing quality. He said: "It would be tragic if degrees were to be 'dumbed down' to meet some arbitrary target." Liberal Democrat Shadow Education Secretary, Sarah Teather MP said the party had long argued for flexible study. But she said this should be about letting students get the most out of their university experience "not as a 'crammer' course that might help reduce living expenses. Academics' union, the AUT, said it was concerned that reducing a degree to two years would diminish the university experience. Its general secretary, Sally Hunt, said: "University is about so much more than just getting students through their degree and out the other side. Worryingly a lot of recent higher education policy seems much more concerned with a bottom line and treating students as commodities."